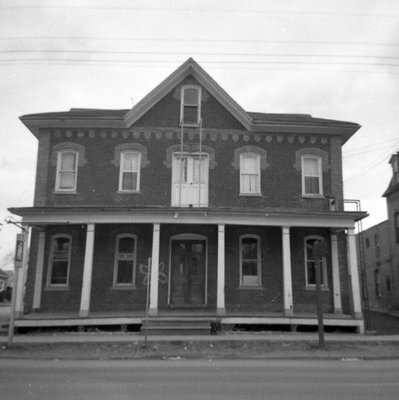 A black and white photograph of the Brooklin Hotel located at 56 Baldwin Street. The Brooklin Hotel was built circa 1882 on the north-west corner of Baldwin and Campbell Streets. It closed in the late 1960s and in 1970 became the Brooklin Legion Hall. 56 Baldwin Street, April 11, 1966, Brian Winter. Whitby Archives A2013_004_273.